In “The Wish” we’re introduced to another character—Anya—who seems to conveniently serve the plot of the episode, but in fact, she later becomes one of Scoobies, which seems unlikely given how we first meet her. As a vengeance demon, Anya grants Cordelia’s wish, sending Cordelia to an alternate timeline in which Buffy has never graced Sunnydale with her slayer skills. The results may be lost on those unfamiliar with the Buffyverse, with Xander and Willow as vampires, Angel as a pet for The Master, and Oz and Larry as demon hunters. However, because it occurs in an alternate timeline, the episode is pretty self-contained and easy to follow. 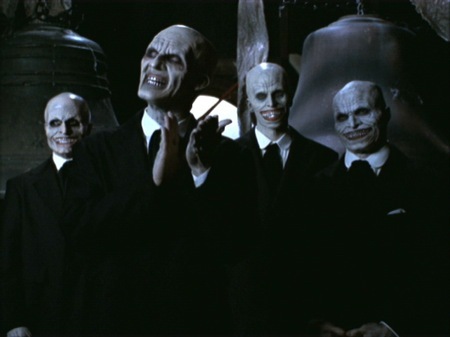 A well-deserved Emmy-award winner, “Hush” may be the only Buffy episode to give you nightmares, thanks to the unsettling villains, The Gentlemen. As a result of The Gentlemen’s magic, everyone in Sunnydale loses their voices, which conveniently gives Buffy a chance to show off as more than a vehicle for Joss Whedon’s famous dialogue quips. With the sharp discourse stripped away, this episode demonstrates the show’s story development, visual storytelling, creature design, and nonverbal writing as the characters explore both the value and the limits of verbal communication… all while saving the day. For a cheesy episode with lots of meta-jokes and musical numbers, “Once More with Feeling” is more than just Rocky Horror Picture Show for Buffy fans. Despite its ridiculous villain (who makes people sing and dance to death), this episode doesn’t lack depth—showcasing a tonal duality that’s difficult to pull off. When Buffy says, “Life’s a show and we all play our parts,” she angrily explains that she’s expected to put on a happy face because “life is a gift” and you should “whistle while you work.” Rather than trying to cheer her up, Spike meets Buffy’s exasperation by simply saying, “Life’s not a song. Life isn’t bliss. Life is just this. It’s living,” which is oddly comforting. Many shows feature characters who supposedly face serious financial hardship but somehow magically make ends meet. In Buffy, the main character’s financial hardship is not a running punchline or something that’s mentioned and then brushed under the rug. No—Buffy has to face the reality of joining the fast-food industry in order to pay the bills in “Doublemeat Palace.” Mystery meat, disappearing coworkers, and a fantastic twist culminate in a perfectly creepy episode that channels the best of schlocky horror. What episodes would you add to this list? I’ll be honest, writing this post just made me want to watch the whole show over again. Oooo, if you watch any of them, let me know what you think! I was about to say, “I bet playing a Halloween-themed video game like “Until Dawn” is more up your alley.” But then I checked your website, and I saw you uploaded a review of “Until Dawn” today! Too funny.